Beginner? Rusty Racket? Team Player? 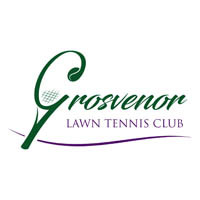 Whatever your level, whatever your age, from under 8’s to over 80’s, Grosvenor Tennis Club’s team of LTA Registered and Licensed Tennis Professionals can help you get the most out of your game. We run a full programme of Junior squad coaching on Monday’s, Wednesday’s, Thursday’s and Saturday’s, covering all stages of Mini Tennis (Red, Orange & Green) and Yellow ball Junior tennis. Each term runs for 10 weeks and prices range from £35 – £40, payable upfront, with a 15% discount for any child that signs’s up to 2 sessions. Big match coming up? Forehand looking a little rusty? Why not take a private lesson with one of our team? Available to all Junior and Adult members (including Mini Tennis players), our team of coaches can help you to reach your personal goals by providing a quality coaching programme tailored to your Tennis needs, in a structured, supportive environment. Please see individual profile pages for further information.